State regulators ordered a gas drilling company to halt operations in an area of northeastern Ohio after three minor earthquakes were felt in the area. No property damage had been reported from the earthquakes that happened Monday morning just west of Youngstown. The Ohio Department of Natural Resources says there's nothing indicating that the earthquakes are connected to any injection wells. 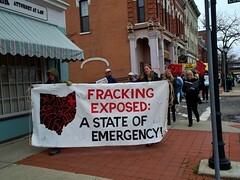 Who'd be so crazy as to say Ohio's brand-new earthquake zone is connected to fracking? Oh yeah - the Ohio Department of Natural Resources said that two years ago. Multiple studies have also linked Oklahoma's outbreak of more than 2,500 small quakes to fracking. But Kasich has state employees spending taxpayer dollars on doing public relations for gas fracking, so state regulators have to do the bizarre dance of shutting down fracking wells while not saying the wells are causing the earthquakes. Then why shut them down at all? Learn more about the risks to land and drinking water at the Ohio Environmental Council.